When I think bikes, I don't immediately think Raven Guard but maybe you should. 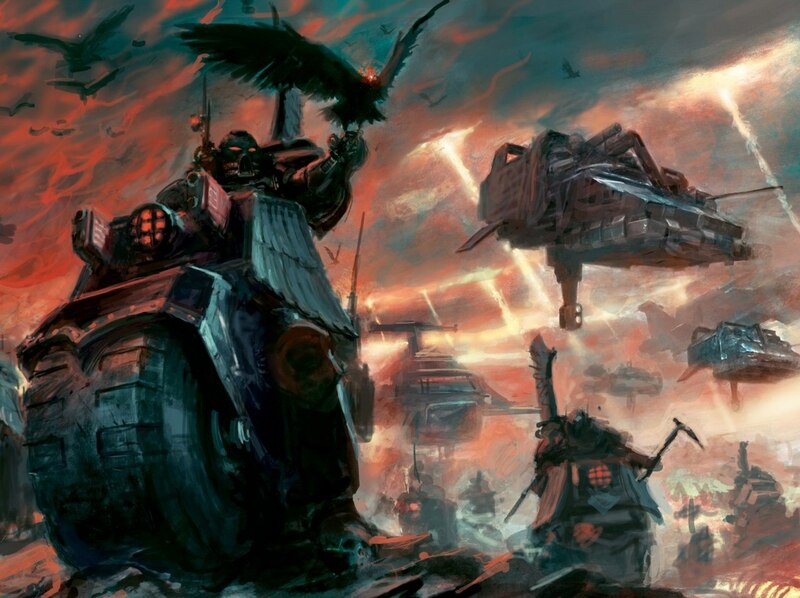 They are part of the of the Raven Guard arsenal and more importantly, unlike most legions, Raven Guard have special rules that make them better. Jump Infantry, Bikes, Jetbikes and Infantry in Terminator armor gain furious charge. +1 to Strength when we charge, means we are better than other legions when charging. So what are our Options and how do we get the most out of them? Seems an odd place to start a tactics review on bikes, but bear with me. Graviton Gun: 15 pts for an 18" haywire weapon is ok. 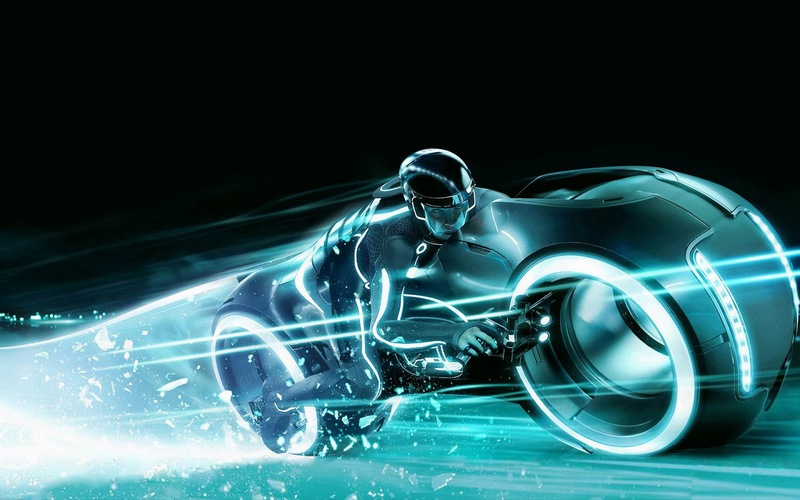 But on a bike you ignore the heavy weapon rules, which turns this option into gold. Rad Grenades: 10 pts to reduce your opponent's toughness by 1 in hth. Sure that sounds great! 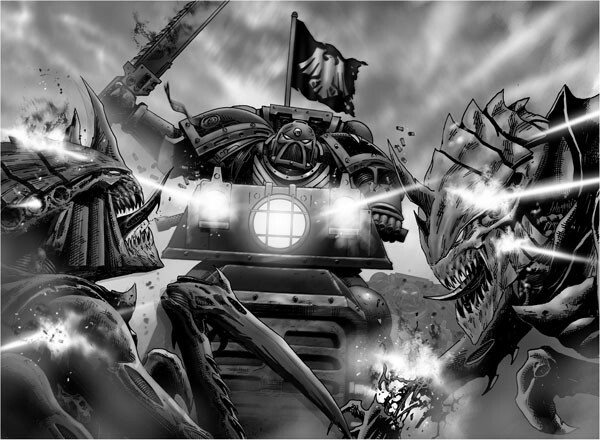 But with Raven Guard to are S6 on the charge with a power axe so you are OBLITERATING T4 2W terminators on the charge. Nuncio Vox: Admittedly a side perk, but they a 12" scouting vox is an especially good combo with drop pods. Cyber Familiar: Enter the iron halo. 25 pts to give yourself a 4+ Invulnerable save. Cortex Controller: Opens up some big stompy robots if you wanted to field them. Suggested Build: 155 pts - Forgelord on a bike, w. rad grenades, grav gun, power axe, artificer armor, and servo arm. I've seen some fanfare recently for a 3 centurion bike star. Different consuls can really add a lot to this units. The Primaris Medicae add FNP, a chaplain makes you fearless, librarians can also add some intersting force multipliers. In general, I think other legions do it better than Raven Guard. Furious Charge is better the more attacks you have IMO, but I thought it was worth mentioning as the unit does compare similarly to a command squad. These are you basic bikers and at first glance don't really look like much of a deal, but they have a couple hidden gems in their rules if you read between the lines. Wargear: First off, they comes with twin linked bolters AND a pistol AND a CCW and are relentless. So you can double tap your twin linked bolter and charge with 3 attacks, plus your hammer of wrath attack. Which is basically 2 marines with 2 CCWS worth of output. Scout: A bittersweet rule on this unit. Sure, it's awesome to move your unit up the field or to out flank, but you can't charge the turn you outflank or scout. So you end up forcing the unit to be a late game unit, unless you invest big points into shooting. Melt Bombs: At 35 points each with melta bombs they are a decent tank hunting unit. I would say really good, but you won't usually get to charge until turn 2 or later. So they aren't great for an alpha strike build list, but good for a beta strike or reserves build. Power Weapons: 1 in 3 bikes can get a 10 pt power weapon. AWESOME! No seriously, it's pretty good. Especially, since we already get a +1 strength and they stack. So you can be S6 on the charge!!!! Sergeant: 15 pts for +1 LD an +1 attack... It's not really a great deal, but LD is really important for HTH... I would usually skip this guy and run a IC with them. More on this in a sec. Suggested Build: 330 pts - 9 Outriders, 9 Melta bombs, 3 power axes, Sgt w. power axe. 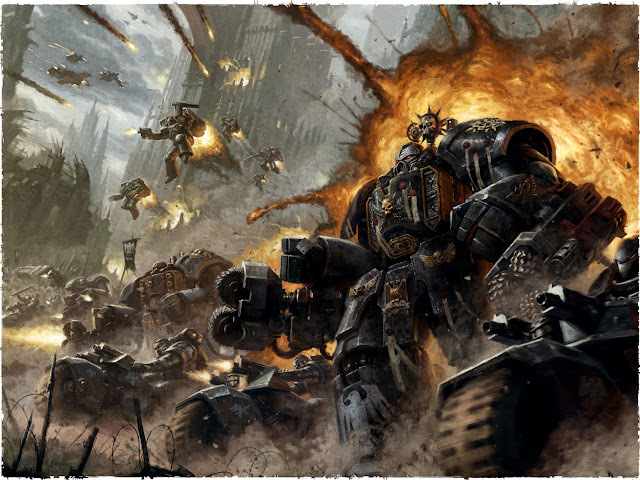 On the Charge: 13 S6 power weapon attacks, 18 s4 attacks, and 18 twin linked bolter shots. Add a Forgelord: Now your 13 s6 power axe attacks, plus the 6 more from the forgelord are obliterating T4 multi wound terminators. One of the few units in the Raven Guard list that can actually do that in HTH! Reconnaissance ROW: Any unit that scouts first turn starts with shrouding. It's a huge rule for a unit that can already jink for a 4+ cover save. Welcome to a unit that moves starts forward 12" and is in 2+ cover out in the open! Enter the BETA strike list. You don't see many attack bikes in 30k. 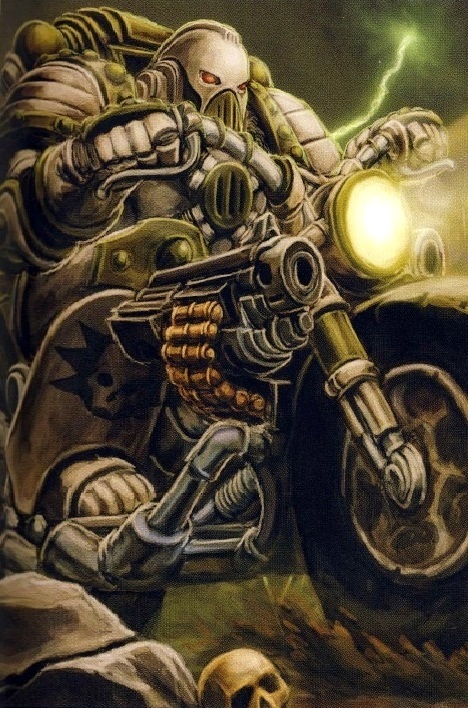 This might be because there isn't really an attack bike model that looks like the 30K bike equivalent... As for the rules, it comes off as a little expensive compared to similar units, and in regards to Raven Guard it doesn't really have much in the way of HTH options. BUT... In the right list, it's actually a sneaky good unit that has a very Raven Guard feel. Base: 2Ws, 2 attacks, a hvy bolter and a twin linked bolter. Melta Bombs: Melta bombs are always good on a fast unit. Auto Cannon: An interesting and totally unique option to 30K. Interesting harassing unit. Multi Melta: Not much in 30K actually has multi meltas. Suggested Build: 275 pts - 5 attack bikes, melta bombs, multi melta. Add Vigilator: A vigilator with scout armor and a jump pack give this unit scout or outflank and move through cover, plus the jump pack lets him keep up. AND he comes with cameoline, so your unit now has a 3+ jink if you need it. Reconnaissance ROW: Scout the attack bikes first turn and now you are in first turn multi melta range of basically anything and you have a 2+ cover save. Heavy Weapons: 1 in 3 can upgrade their heavy bolter to a volkite culvern, a multi melta or a plasma cannon. Which sounds like a good option if you jink you can't even fire the plasma cannon and the multi melta is only a single shot. You see a lot of fanfare for the Volkite option in other lists, but honestly we have other way to eradicate infantry and light vehicles. Melta Bombs: Totally a valid option for these guys! They are fast, can turbo boost into position. Deep Strike: Works with a lot of Raven Guard lists, think no scatter with Maun. However, you can't really get a lot of multi meltas in the list and the other weapons you might as well start on the board. Suggested Build: Honestly, I don't really have one. I'm tempted to say a take a couple with melta bombs and run it as an HQ body guard, but even that is done better with a command squad. They can do the same tricks are outrider or attack bikes, but don't really have the HTH teeth of the outriders or the heavy weapon saturation of the attack bikes, so why bother. Ok, once you get past the burning desire to run your command squad with jet packs you will see that command squads on bikes are really quite good. Squad Members: Extra members to this squad are a good deal, so I always run them as 5 guys. Artificer Armor: 2+ save! Yay! Melta Bombs: Again a good option on a fast platform. Combat Shields: 5 pts for a 5+I in hth is a pretty good deal. Power Weapons: All the power weapons! I mean, All the Power Axes! You can totally run down the Forgelord rad grenade road with this unit. Combi Weapons: Speaking of which... All 5 guys can take a combi weapon. 10 pts isn't necessarily cheap, but remember you can move and double tap your plasma guns and charge or do that with melta guns and charge the unit in the transport you just killed. Suggested Build: 390 pts - 5 Command squad, bikes, combi Weapon, power fists, combat shields. artificer armor. Add Vigilator: Again, a vigilator with scout armor and a jump pack give this unit scout or outflank and move through cover, plus the jump pack lets him keep up. AND he comes with cameoline, so your unit now has a 3+ jink if you need it. Now you are using those combi weapons first turn. Add Praetor (or delegatus): Totally not necessary, but if you are taking one to open up a ROW (which you probably are) then this is a good place for him to hang out. As for a build concept, consider a praetor on a bike with a halo a, fractal harrow blade, a paragon blade and digi lasers. Add Primus Medicae: You almost never have a good spot run this guy, but in this unit you basically make them crazy resilient. 2+ armor, 2+ cover first turn, 3+ jink, 5++ in HTH with feel no pain is about as good as it gets. I hope that blew a couple minds! In general, if you are going to run bikes, I think the Recon ROW really gives you some interesting options. 3 outrider squads can put a lot of pressure on the enemy and remember you only need 1 forgelord to drop a units toughness. So you can send 3 bike squads in with one forgelord and absolutely explode most death stars. Add in a unit with a vigilator and now you have 4 scouting units and don't forget that all your infiltrating units are getting shrouding too. So feel free to mix in Mor Deythan and the like. Hell, even dark fury squads with a vigilator scout and pick up the shrouding and stealth first. Finally, on paper, you are going to look at your list and go, whao this is small... But your army should have 2+ cover on the first turn and you are going to be in HTH a lot of the game. Plus you are re rolling to go first AND re rolling to seize the initiative, so play aggressively because you can hit really hard both first turn AND second turn, which should reduce how much damage your enemy can throw back at you.